When I looked at this picture (to the left) that was pinned on pinterest, I was in love. How could you not be? Avocados are one of the best tasting foods out there and even though they are a fatty food, it's the good fat. How can there be good fat you ask? Well, there is a certain kind of fat that actually lowers cholesterol and is good for your body. I swear. And as long as you eat them in moderation, the benefits far outweigh the negatives. Don't believe me? 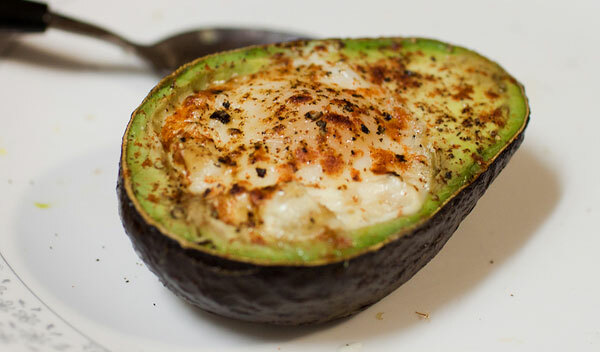 Check this out: http://www.reddit.com/r/food/comments/oettz/baked_avocado_and_egg/. There are also plenty of other sources out there that will tell you the same. I decided to give this egg/avocado mix a try and also take on my own version of toppings. This is the first post about what I'm affectionately calling, "The Avocado Topping Experiment." I split an avocado in half, took out the stone and cracked an egg on top of one of the halves. After a sprinkle of salt and pepper, it went in the oven. After about 20 minutes I was getting pretty anxious to taste the results. After another 5 minutes, the egg was cooked enough to my liking so I took it out of the oven and let it cool a bit while I prepared the next topping choice. I caramelized some onions, cooked them up with a little bacon and put that with a little shredded mozzarella on the other avocado half. I stuck that in the oven until the cheese was melted and everything was heated through. This one only took about 7 minutes. After letting the second one cool for a few minutes, the time to taste had approached. I tried them both and the egg one wasn't that great. It seemed a bit bland and almost like it was missing something. It needed a different flavor that the salt just didn't have. The one with the onion and bacon was really good though. The additional saltiness of the bacon probably helped the taste and, well, the fact that I love onions didn't hurt. 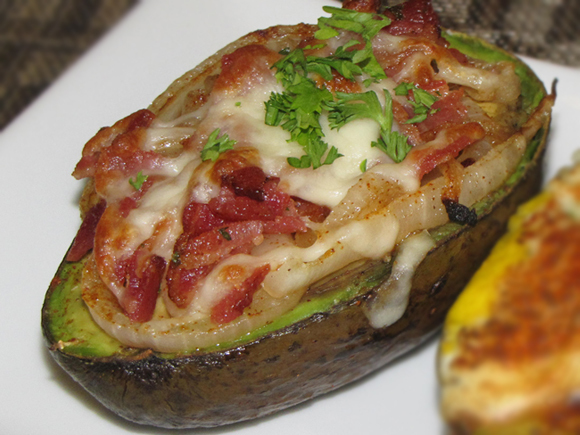 So after all was said and done, I'll still recommend the egg topped avocado as well as the cheese, bacon and onions. The egg one needs a bit more flavor in my opinion, but I'm still trying to figure out what that flavor should be. Maybe a little hot sauce? 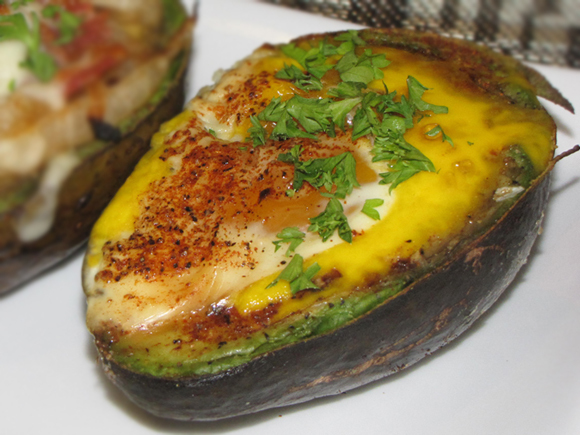 I don't know exactly what, but something to bring a contrast to the mildness of the egg and the avocado itself. The bacon, cheese and onion one was awesome on it's own so I'd keep it as is. If I were to add anything to that one though, it would maybe just be some simple herbs to add another level of flavor..
Avocado goes so well with so many different things that this is one experiment I will be continuing. I'm very curious to see all the different flavor combinations I can come up with and what the end results will be so if you love avocados, be sure to keep an eye out for the next 'avocado toppings' post.